The NZ Sprint and Long Champs have been held in and near Oamaru, with three Hutties dominating their classes. They are Jill Dalton in W75, Gavin Scott in M75, and Ted van Geldermalsen in M60. Those gaining 2nds are Jack Maddigan (Long M14B), Nicole Maddigan (Sprint W18) and Michael Wood (Sprint M70). Full results on the event website and on Winsplits. Further to the item below, the maps for last Sunday are now available on the website. There's the 1km Course A, and the 2.8km Course B, and the 5km Course E. We suggest A without the motorcycle area as a warmup, this required special permission. And then either B or E but not both as they are similar. Read the event results below to find the course in the cellphone app. You can get more info on the event calendar by looking for last Sunday's event under "Past Events". Sorry this is not so tidy, just trying to make things available before Easter. In due course we'll publish this in "Anytime Orienteering". The weather today was 1000% better than February's MTBO at Wainui. And there were 22 times as many partcipants, heh heh! A 1km sub-sprint tested reading ahead especially in a motorcycle practice area riddled with tracks. And the 5km middle distance course round the Wetland Loop extracted 30-60 minutes of navigation. Results for most of the participants were on their cellphones as they crossed the finish line, including a RouteGadget plot. For others, see them on the MapRun website via our result summary as this gives some hints for finding our event in a big list. 3hr rogaines, envisaged as "practices" for 24hr events, have taken a life of their own and are OHV's most popular formula. 117 people set off from the Tawa Pool in balmy conditions last night, on a course that covered Colonial Knob to east of the motorway, and Arohata to Kenepuru. There was as much rural land on the map as urban. Jamie Stewart and Caspar Harmer won the 3hr in spite of a big lateness penalty, while an Onslow College team was top in the new 90 minute category. Lots chose the walking categories too. Results include a link to Strava Flybys. 60 secondary school students rogained their way up the riverbank from Sladden Park to Avalon Park today, in the Wellington region's Senior Get2Go Challenge run by Hillary Outdoors. With various extra challenges such as being allowed two mountain bikes per team of four. Orienteer Darren Ashmore runs these all round the country, and we contributed our river corridor mapping to them. The winning team (from memory) was an all-girls team from Onslow College. There's a Junior Get2Go too, which we'll help with in August. Torrential rain in Wellington, fine and dry in Waitarere Forest for the 3rd event in the Orienteer of the Year series on our map Walda. Conor Short beat brother Ruairi on Long Red for a change, while in a sign of things to come, junior Oliver Edwards almost beat experienced Malcolm Ingham on Medium. Newlands student Ben Smedinge won Red Short, Jack Braddick (Onslow) the Orange, Ellen Buchanan the Yellow and Pania Hudson the White. Results have been posted. Members have been competing up and down the country. Andrew and Amber Riddle were 2nd in class at the Otago Champs near Middlemarch. Amber, Olivia Healey, Kieran and Oliver Edwards were at the trials in Auckland for the NZ team for the Junior Worlds. 24 members have entered for the NZ Champs in and around Oamaru at Easter. Meanwhile there has hardly been a Sunday gap around here with low-key events, the renewed "Orienteer of the Year" series and the start of the CollegeSport series. While some club members were running a Riverlink promotion for the council, others welcomed a big group of schoolies and others at an introduction to the College Sport Series. The Riverlink course went north to the Melling Bridge while Simon Rea's two courses went south and into Hutt Valley High School's building maze. While the first battle doesn't win the war, Nicole Maddigan (Chilton) was the top student (and top OHV member) on long, while Rebecca Connolly from St Mary's did the same on short. Results have been posted. 50 orienteers practised today on the map at Wainuiomata which is destined for the chainsaws soon. Many were secondary school students, whereas all of us could benefit from running courses with a mate, observing and discussing technique. Malcolm Ingham the ONZ HP Director has commented on this imbalance between practice and competition, on the ONZ website. You can read an event report here, but shouldn't read too much into the times. After mispunching at Sunday's OY at Waitarere, Wgtn's Stuart Engleback returned to the front of the pack at tonight's summer sprint at Percy's Reserve, almost making the target win-time of 12-15min. Ellie Molloy was the top woman on Bruce Worsley's longer course which reached Frank Cameron Park before returning to the gardens and a control on the island. Larissa Edwards was the fastest on the shorter course. Results have been posted. As last year at Belmont, an intended easy mountainbike event was confounded by the weather. Or should that be the weather forecasters, who predicted much worse rain than actually fell at Wainuiomata today. William Power was the top rider on the 1km sprint which included the maze-like motorcycle circuit. And the top rider on the 5km Wetland Loop-with-extras. Meanwhile experimenter Michael Wood proved that the cellphone app MapRun works in the bush. Results have been posted. Felix Williamson topped the table at tonight's sprint in Maidstone Park, after earlier riding to school in Wellington. Olivia Healey who is at Upper Hutt College was the top woman on Gavin Scott's 3km course. Jonty Nguon from Newlands College won the shorter course. Results have been posted. 20 orienteers made the most of a Sunday gap to practice in some of our trickiest terrain - the "Rabbit Warren" in Belmont Regional Park. Control locations and ribbons were set out by the participants, mostly schoolies. Location accuracy was outstanding. With a bit of logistical support these kids could be running events. Teams in today's P-Max mini rogaine at Avalon were given a couple of allowed crossing points for the Hutt River (although it was probably crossable almost anywhere). Nicole and Greg Maddigan were the top scorers, with 270 of a possible 295. Results have been posted. And both map and questions may be downloaded from the Anytime Orienteering page. Look down the bottom, there's a whole group of P-Max courses you can do. OHV debuted new maps in Wainuiomata today with three nose to tail sprint courses. First and last were in the high school, with the inadvertent locking of a gate preventing the adjacent intermediate and primary campuses being used as well. 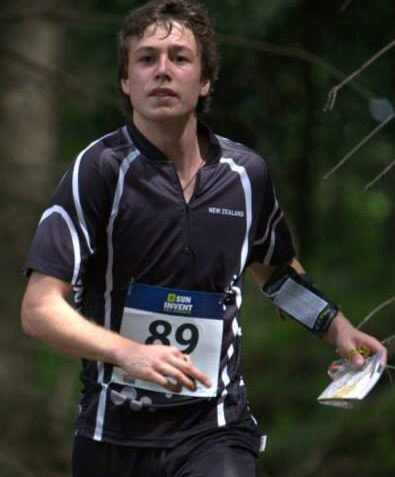 Still the course in the Wainui Trail Park was full sprint distance at least for the winner Ruairi Short of Ireland. What is it about Ireland, Bill Edwards was second overall! Yvette Baker (formerly UK) was the top woman (7th overall). Download results here. A Hutt News story about the oldest NZ sporting prize, the Ballinger Belt for rifle shooting, featured former OHV member Ross Mason. From Pinehaven, Ross was a regular orienteer in the 80's including planning major events. Since then he has coached the NZ Paralympic shooting team, and is chair of the NZ Rifle Assn. The NZ Champs are currently being held at Seddon Range, Trentham. OHV ran the last NZ event of 2018 and the first of 2019 over the summer, with U-Max events at Wainuiomata and Silverstream. And last weekend 11 Hutties sweltered in the South Island Champs in Marlborough. Jill Dalton W70 and Bill Edwards M50 collected two wins from the 3 events, while other winners were Oliver Edwards in M16 and Michael Wood in M60. Full results are on Winsplits, and there's an OHV summary here. But this was inevitable without a City Safari this year. The underlying 2018 numbers are about 10% down, that's just a normal fluctuation. Brought to you by our VIP members - that's Volunteer Important Persons (listed). Not counted are our low-key U-Max activities, nice one today, or our afterschool training sessions. That was the winner's assessment of the red course at Wainuiomata today! It helped to have some pine forest in perfect condition, just awaiting a logging contractor - pity we've only just discovered it. Michael Wood's one-man event simplifications made this event feasible. Results have been posted, and the courses are on the ONZ calendar for a limited time. Big Trig planners Keri Devine and Rob Smith won the Mixed Open/Vet category in the NZ Rogaine Champs which finished at midday today. Kelvin Thiele and Richard Persson won the Mens Vet, while Sam Walton and Angus Watson were 3rd overall/Men Open. Though touching on Dunedin suburbs the course included the bushclad Silverstream catchment and 700m peaks to the north. Teams faced continual drizzle and cold overnight temperatures which caused premature finishing from a number of teams. Results are on the NZRA website. The AGM tonight re-elected Simon Rea as OHV president, and a committee of Barbara Bridger, Greg Maddigan, John Robertson and Michael Wood. Subscriptions for 2019 are unchanged. Download the President's Report here, and members may request the financial report from the secretary. Rogainers combed the bush-clad hills which surround Wainuiomata, in yesterday's "Big Trig" rogaine. The course ranged from the Rata St loop above Naenae to Lowry Peak and the Top Forks in East Harbour Park, and previously unused bush between Arakura and Moores Valley. 60 people from Chch to Canada took part, with Kelvin Thiele and Richard Persson winning the 6-hour category. And no-one could keep up with the Jones's in the 3. Results and winners routes are on the BigTrig website. While we are paying more tax at the petrol pump, NZTA is raising highway standards and the latest interchange design at Haywards incorporates cycle bypasses, footpaths, railway parking, footbridge and extensive planting. Hidden in the planting are extensive watercourses which appear and disappear into culverts. Michael Wood has mapped it to sprint standards and Sunday's U-Max had 8 controls there; in addition to a tour of Manor Park and bush section up to the Dry Creek waterfall. The Oz Champs Carnival in South Australia kicked off on Sat 29th. Jill Dalton placed 3= W70 in the short distance, AND TODAY 30th won the sprint. Also there were Amber Riddle W20E and Oliver Edwards M16, and our Melbourne-resident members Margi Freemantle W60 and Ted van Geldermalsen M60. Ted also ran well in the Sprint for 2nd. AND ON Sat 6th he won M60 in the Long. Full results here. A 60min Petone score course has been added to the Smartphone orienteering app MapRun, see news item 29 Aug. Its called "Hutt Valley MapRun Sep 2018..." and like the 30min course it starts in Sladden Park. The (larger) area is covered by two maps:	the North bit and the South bit. You don't need a PIN number to access it (and the PIN has been taken off the 30min course too). Check out results here. Ever thought your mobile could help your orienteering? Now it can with app Maprun. Invented by an Australian orienteer, he's set up last Saturday's 30min event at Sladden Park so that you get a beep when you get close to each control. The app works out your score, posts results to a website, and your route onto RouteGadget. Its free on Google Play and the App Store. The course is called "Petone...ScoreV30", in a "Hutt Valley" folder inside a "New Zealand" folder. You'll also need this 4-digit PIN to proceed: 3923. You can rely on the map on your mobile, or you can download and print the map here. Read more about the system. PS its all ridable, but we suggest 20min for bikers. The Mini Adventure Race along the river today attracted even more than in June, predominantly school teams practising for Get2Go. The course dipped into bush trails behind the Haywards substation, traded off a steeeep climb against track distance, tested compass skills in riverside willows, and distance estimation/observation along 5km of river trail. The course consisted of 4X1-1.5km foot-o sprints linked together by bike nav. Results have been posted (the Chapter 2 worksheet), and the planner has listed his Route Choices. The top three teams (well clear of the rest) were from Onslow College, a Godzone AR team, and a couple of Hutt intermediate schools! Laura and Tim again showed their class in the mixed sprint relay in Latvia today. Laura lost only 48sec on Sweden which led throughout the race. From 14th Tim pulled back 9sec on the lead to hand over in 6th. He's on fire!!! Auckland's Cam de Lisle drifted back to 14th again before Lizzie Ingham rescued two places, for NZ's equal best in this discipline. Australia was 19th. If only Tim and Laura had twins!!! Tim's Facebook page reveals that he dislocated his shoulder (for the 4th time) shortly before the giant Jukola Relay at the weekend. Link above. Makes his 10th-place first-leg run all the more remarkable - and risky. Best wishes for a solution Tim! Though last night's rain raised the river level again, the sun came out right on cue, just as 30 teams assembled in the riverbank carpark for today's experimental "Sprint Adventure Race". The course involved 10km of riverbank biking (with periodic swaps between trails and sorties into the willows). Punctuated by four 1km sprints on foot. Updated results have been posted, and the planner has listed his Route Choices. Organised by enthusiastic parent Bill Trompetter, Hutt Valley HS re-emerged as a successful team on the college-sport scene this year. The team held 12 practices on the school grounds, civic centre and riverbank as far as Melling Bridge. They have started a team website listing some of their coaching resources. Four wins for OHV members in the the CSW series after the final at Colonial Knob at the weekend. Amber Riddle, Kieran Edwards (senior) and Rebecca Connolly (Y7/8) had titles in the bag before the last race, but to finish 1=, Nicole Maddigan had to win the last IG race AND beat her rival by 3 minutes. She made it with 1-2min to spare. The dice rolled the other way for HVHS' Sophie Waters in JG. Narrowly leading with 99.5 out of 100, her rival won the final and the series by 2min. See other placings gained by OHV members or OHV-coached teams including Chilton, HVHS and Newlands. Tim Robertson played a big part in his Finnish club’s (Koovee) 3rd place in the Tio-Mila relay in Sweden last weekend. Tio-Mila has 300-odd 5-person youth teams, 300-odd 5-person womens teams, and 300-odd 10-person mens teams, and the guys race thru the night. Running the pre-dawn 7th leg, Tim caught up 1min on the lead and 4 places, in a race of nearly 12 hours. Get the flavour at Tims FB page, and here. The other big relay in Scandinavia is the Jukola in Finland on June 16-17. It's even bigger. 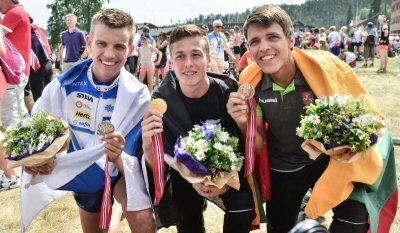 Koovee has won Jukola twice, last in 2016. Lots of results were turned on their heads at today's Middle Distance MTBO Champs at Chatto Creek near Alexandra. There was complete freedom to ride anywhere in a huge paddock of rolling contours. There were no OHV wins (not even the Drews!) But the M70's beat their Australian counterparts for the first time in 3 days. And staying the same was the 6-1 kiwi dominance over Australia. Results and links to Winsplits and Routegadget are on the event website. Both Rachel (W40) and Liam (M40) won their classes in the NZ MTBO Sprint Champs at Alexandra today. The courses used extensively-tracked riverside terrain near the Central Otago Rail Trail, and was the first of three races counting for the Aust-NZ MTBO Challenge, with NZ going 6-1 up. Jim Sutherland (M60) and Michael Wood (M70) placed 3rd. There are 7 OHV members riding. Results are on Winsplits. ADDED 26 APR: Rachel and Liam won again in the long on rocky open terrain, Jim improved to 2nd, and Michael was DSQ for crossing a not-allowed fence. NZ is now 12-2 up. A U-Max do-it-yourself event was run in warm sunshine today at Catchpool. Ribbons were put out for one of the short courses run there in February, a group walk discussed techniques on another, and a couple of people even did the third as well. This was the 25th DIY event run by OHV over the last couple of years, filling gaps in the Sunday programme. MTB-orienteers have also been doing training exercises in preparation for the NZ Champs in ten days' time. Bill Edwards is unbeaten at the NZ Champs with another win in M50 today. Amber Riddle backed up her sprint win with another in the middle, while Susan Edwards won W45 ahead of one-time elite star Tania Robinson. Michael Wood came 2nd and Ted van Geldermalsen 3rd (the latter after two wins). Summary... And in the relay OHV posted an excellent 3rd in the Masters (M/W40-) relay, with Ted, Susan and Bill. We also had a team in the large open class (26th) and a vets (M/W60-) team which placed 6th. Three OHV members won gold at the NZ Champs Sprint in Auckland University today, by substantial margins. Jill Dalton in W70 by a minute, Bill Edwards M50 by half a minute in front of a visiting Australian (1min ahead of the next kiwi) and Ted van Geldermalsen in M60 by a whopping 2min 44! Amber Riddle and Michael Wood were 2nd (Michael by 1sec). And in the long distance Saturday, Bill and Ted repeated their wins. Summary... The champs continue Sun-Mon in Woodhill Forest. Tim Robertson has won a sprint knockout in Spain, held to a new format in which runners compete head to head over a series of 8-min races. The race was part of the Mediterranean O Camp, popular among northern hemisphere elites coming out of winter into a new season. Get the feel from this video from Tim's Facebook page. Simon Kennett and John Randal, aka The Makara Peak Mudslingers, won the 8hr Akatarawa Attack today. They've won more than any other team in the 13-year history, only beaten once and then by a whisker. Alastair Campbell and George Willock won the larger 4hr class. But with less than half the Mudslingers points this shows their class. The course spanned Totara Park to north of Karapoti Gorge, and west to Moonshine Road, including the Rallywoods 4WD park. Preliminary results have been posted. Three nice little one-fifth sq.km areas were cherry-picked from the Catchpool map, and 1.5km courses set on them for today's "Multi-Short" event. 9 keeners did the lot including 5km of transition running, while others chose one or two of the cherries. Beautiful day. Results have been posted. While the controls have been taken in, any one of these maps would be great for a training run or introduction for your family/friends. Catchpool is just 20min from downtown Lower Hutt and links to the maps are on the calendar listing. Noticed the high temperatures lately, its the heat from our calculator adding up the 2017 participation stats! For the last 3 years, we've been around 3000, that's 30% up on the 3 years before that. Brought to you by our VIP members - that's Volunteer Important Persons (listed). Not counted are our low-key U-Max activities, nice one last Sunday and another on 31st. 80 rogainers spent up to 9 hours in Belmont Regional Park today, with 13 of them opting to do 3 of their hours in the dark for a bonus of 20%. Tim Farrant from Christchurch with local Theo Wordsworth won the long course, with old multisport mates Al Cross and Nigel Corry top over 6 hours and Orsolya Vincze and Victoria Apablaza best over 3 hours. Preliminary results have been posted on the the event website, with stories/routes expected in a day or two. History may reveal whether OHV has held the Frank Smith Interclub Trophy, since the club donated the cup to recognise its founder. But it came really close to winning it yesterday - scoring 85 points as against WOC's 89. As with Tonga, cause for celebration! Consult the the points table. Hard work, the help of our neighbouring clubs, and warm summer weather led to a great Wellington Area Champs over the weekend. The interclub competition for the Frank Smith Trophy was also decided by today's Long Distance. Results are on the event website which has links through to Winsplits and RouteGadget. Hutties (mainly juniors) came away with 18 area titles over the three events. Andrew Riddle was the mastermind. Rogainers and orienteers who used mountain races as part of their endurance training 20 years ago will have come across Colin Rolfe. He was the epitome of laid-back-ness but won a number of major races (Tararua, Holdsworth-Jumbo, Kaweka) and was one of the first to complete the Schormann-Kaitoke (N-S traverse of the Tararuas) in 24hrs. We hear he has died in Nelson where he was living after being on the Kapiti Coast for a long time. Details are sketchy, but he was still actively running and reputed to be in a 2018 Godzone AR team. He was 57. OHV took four titles at the NZ Champs in Hawkes Bay over the long weekend. Star of the team was Jill Dalton, winning the sprint and middle in W70; she also took 3rd place in the long. Gavin Scott won the middle in M75, with 2nd in sprint and long, while Michael Wood won the sprint M70 (with 2nd in middle). In the relay an all-junior team of Kieran Edwards, Amber Riddle and Oliver Edwards finished 19th out of 60 teams in the premier grade, and we also gained 17th in the short class and 50th premier via a composite with Wairarapa. Read the HV summary, and delve into the full results and Route Gadget. Today's U-Max was the biggest yet with 11 people enjoying a non-standard multi-level map at Seatoun. U-Max has plugged all Sunday gaps since mid 2016, except for Christmas Day! And provided training without significant organisation. The latest report from ONZ High Performance Manager Malcolm Ingham contains a comprehensive review of the recent international events NZ has competed in. But it also reveals that Wgtn's Lizzie Ingham, running in last week's Swedish 5-days competition, collapsed on the finish line and was taken to hospital. She has been having breathing problems during high exertion recently. She is now resting in Halden, Norway. We wish you well and hope you find the solution Lizzie. A magnificent run by Laura and then Tim, powered NZ into the lead of the sprint relay, until a woopsie at the arena control saw him drop to 4th. Wonder if the course marking was not watertight? Ross and Kate ran well but 8 more teams got thru. An mp by Norway left us in 11th. You can replay the race at IOF Live Orienteering. Malcolm Ingham, our High Performance Manager called the relay "a disaster". NZ narrowly failed to escape relegation to division 3, which would have reduced the number of individual runners we can have in the future. NZ finished 22nd women and 25th men, which is 8/10 off the bottom - but there are 8/10 above us we can hope to beat. Tim had a horror run, and Laura though steady was overtaken by Australia's Natasha Key, nearly twice her age. Read Malcolm's report. Next week attention shifts to JWOC in Finland. Previous kiwi news is collected here. See also the official World Orienteering Champs website, and the ONZ website where Malcolm Ingham is posting regular reports. While you're waiting for today's World Champs long distance to begin (Lizzie starts 9pm NZ time), watch the excellent You-Tube Summary of the Sprint Relay. It took place on Sunday in a smaller city Viljandi which has a 13th century ruined castle, with ancient earthworks providing steep climbs, as well as the more usual townscape. It will be interesting to see whether Malcolm Ingham's pessimistic comments about the sprint courses apply here! Probably unquestionably. There are other event summaries on You-Tube too. In spite of cold and boisterous weather, 20 people tried out a series of sprints along the Hutt River today, connected by running, riding or driving. Some participants chose just one or two to suit their schedules. The sprints totalled 6km while the distance between was 2X4km. You can see the courses on the map download page (run them at any time) and the results have been posted. Read more about OHV's experimentation here. Well almost, 950 people did the 12th City Safari today. Starting from the steps of parliament in warm autumn conditions, teams headed for controls in Karori, Petone, Porirua and Paremata using trains, buses and the cable car. The ferry was not forgotten, the answer to a question was available on the boat and you had to find it "in port". Garth Kiernan and 11yo son Braden won the 3hr section on their 4th safari. Emily Walby, Jeremy Stewart, Andrew Crowley and John Dallimore were top scorers in the 6hr (also riding to and from the event!) Full results shortly. With 2000 competitors in the World Masters Championships, finishing near the top was a feat, never mind a medal! Out of about 450 top-10 placings available from 23 classes over two events, NZ gained just under 10% - 39. Our area (WOA) was responsible for nearly half of that - 17. And Hutties contributed nearly half of that - 8. This from a small OHV team of 10. The OHV summary lists the top-tenners you see at our local and regional events. Bill Edwards was one of 7 kiwi medallists in the World Masters Champs Long Distance in Woodhill Forest today. He was 1:15 behind Mats Nylund of Sweden. Other top results came from Jill Dalton (5th W70) and Michael Wood (6th M70). NZ's best result was a gold in W55 by Carey Nazzer of Taranaki. Another winner was NZ's reputation - the champs along with Oceania and Middle Earth events all in a fortnight, went off without a hitch. The OHV summary has been updated. NZ narrowly won the ANZ individual challenge yesterday, and the relay win was confirmed. In the middle distance among complex rocks and depressions south of the Waikato mouth, Ted van Geldermalsen gained another Oceania gold, while Jill Dalton and Michael Wood scored bronze. Orsi Vincze and Bruce Worsley got placings in non-champ classes. Bill Edwards is saving his body for next week. The OHV summary has been updated, and it links to the full results including Route Gadget. Stay tuned for events in Rotorua this week. Even more success in the Oceania long distance at Lake Rototoa in Woodhill Forest. Jill Dalton (W70), Bill Edwards (M50) and Ted van Geldermalsen (M60) won gold; Michael Wood silver in M70 and Susan Edwards bronze in W45. Orsi Vincze won the non-championship W21B. Keep up with OHV results here. Australia and NZ are neck and neck in the challenge with a relay tomorrow. OHV runners have won medals in the sprint distance on the first day of the Oceania Champs. The bad weather gave way to occasional showers, though conditions at the Unitec campus in Auckland were wet underfoot. Michael Wood was 1st in M70 tho beaten by a pesky Norwegian, Bill Edwards and Jill Dalton 2nd in M45 and W70, and Gavin Scott 3rd in M75. Keep up with OHV results here. Two boys spent an unplanned night in the Eastbourne Bush at the weekend. According to the newspaper it was a common area to get lost in, especially after walkers left the tracks to investigate Gollum's Stream. A search was mounted but they were found fit and well on Sunday morning. East Harbour Regional Park is a favourite with our rogainers, including the lengthy Gollans Stream which makes its way to the coast near Pencarrow. ... though a sunny windless day among the bunkers is a rarity. But 167 orienteers struck it lucky at today's CSW and club event. Andrew Riddle's courses reached into seldom-used terrain north of the G8 (group of 8 bunkers) and back to the new woolshed. Focussing on the women for a change, top runs on each course came from Katie Hill, her daughter Marina Comesky, Harriette Carr, Peyton Morete, Jessica Przychodzko and Holly Inglis. You can see how the guys did by course, and by class, and the details are on Winsplits. Draw and compare your routes in Route Gadget. Tim Robertson has won a major event, the sprint which is part of Denmark's "Spring Cup". It's perhaps one of the early indicators of form after the northern winter. There's an interview on Tim's Facebook page, and remember you can link there any time via the permanent buttons above. Within the Oceania Champs at Easter there's an Australia-NZ Challenge, and the team has just been announced on the ONZ website. It includes Bill Edwards in M50, Ted van Geldermalsen (M60), Jill Dalton (W70) and Michael Wood (M70). You may also know Wellingtonians Lara Molloy, Nick Hann, Ocean Mercier, Gillian and Malcolm Ingham and Dorothy Kane. The Australians who don't have much sand-dune terrain have just run a 3-day on dunes near Hobart. Kieran Edwards planned tonight's sprint, using Upper Hutt College which he attends and the adjacent intermediate. Nice courses on a very good campus after years of reconstruction. Joseph Lynch was fastest on the long course, Felix Williamson took half the time of anyone else on short - maybe a second course. The honours should go to Christine Shuker. Results have been posted, and they are also on Winsplits and RouteGadget. Wellington's Nick Hann and Greg Thurlow won the Ak Attack last weekend, an 8hr MTB rogaine traditionally held in the Akatarawas. This year it was to the south and west of Wellington, with hills up to 500m. As if the terrain wasn't rugged enough, teams were knocked off their bikes and sandblasted by high winds. Results are on www.akattack.org.nz. With competitive events about to kick off 2017, we've done the 2016 numbers. There was a change in the mix of big vs little events; and more orienteers attended slightly fewer events. The business world calls this productivity! This was made possible by 50 planners, controllers and club officers, and probably 30 more on-the-day volunteers. Check out the participation stats and VIP list. Thank you! One to read, and one to watch. OHV ran the first event in the world in 2017! Yet to be verified by the Guiness Book of Records, but Sunday's U-Max was the only NZ event listed for 1 Jan, and of course NZ is first to see the light:-)) Admittedly not a huge attendance, and the event is being repeated next Sunday, see the calendar. The Stratton Street and Jubilee Park U-Max courses are available for download, get the maps from Anytime Orienteering. John Robertson (M50), Michael Wood (M60) and Gavin Scott (M70) scored 2nds in the NZ MTBO Champs near Rotorua at the weekend. John also gained a 3rd, and Gavin TWO 3rds, battling all weekend against former president Chris Gelderman. Nicole Ranger (W Open) Jim Sutherland (M50) and Howard Symmes (M60) were also there. Orienteering Bay of Plenty served up the best combination of areas ever seen in NZ. Results are on Winsplits. Tim Robertson has won the prestigious Park World Tour, which has just concluded with four events near Beijing. Without winning any of the Chinese events his consistency saw him 1 point ahead of Sweden's Johan Runesson. PWT was the instigator of modern sprint orienteering, starting 20 years ago in capital cities of Europe, before the IOF finally took notice and included it in the World Champs. In October he capped off an outstanding season with 4th place in the final World Cup race, a sprint in Switzerland. The terrain was an excellent example of European cityscape with steps, stairs and underpasses. Replay Tim's race here. Tim finishes the season with a world sprint ranking of 9th. See also Tim's Facebook page among the icons above. The sun came out for the inaugural U-Max event today, held on riverbank terrain at Melling. The trees are very passable at this time of year. The formula is designed to provide orienteering on vacant Sundays, and to get orienteers used to choosing control sites and placing controls. Though the markers have been taken in, the map has been put on the Anytime Orienteering page with control circles forming a flat 4.7 or 3.2km course. In spite of course planning duties today, Bill Edwards was OHV's best runner at the 3-day event on the weekend. He won M40A on Sat and Sun before heading out to place controls for today. Other wins were scored by Lynette Porter (W40B Sat), Jill Dalton (W70 Sat), Sophie Smith (JGB Sun, Mon), Lisa Caulfield (W21A Sun), and Gavin Scottt (M70, Mon). Results, and see also Route Gadget. A top result in the NZ Rogaines Champs from Keri Devine and Rob Smith, who were first mixed in both open and vet categories, and 4th overall. You can be excused for thinking they had moved away, they've been working in Chch since planning the Seaview rogaine. Simon (with Derek Morrison from HB) was 15th (3rd Men Supervet), Lara and Leon 30 pts behind in 17th (5th mixed open) while Michael was 6th in a family team in the 7hr subsection. Nice result from former members Ramash and Jo Swamy, with twins Ruby and Oliver (4yrs) who did selected parts of the 24hr and were awarded 1st family team. Kelvin and Richard retired. Simon Kennett is regarded as one of NZ's mountainbike pioneers, and with John Randal he's won 6 of the 10 8hr Ak Attacks. Today he added a 7th, accompanied by brother Jonathan and Andrew McLellan. In second place were our new MTBO coordinators Rachel and Liam Drew, riding with Sheila Hart. The course started at Whareroa Farm, and there were easier controls in the flat in QE Park. Results and winners routes have been posted. Overcoming snow on the desert road and the long distance, a Whangarei team posted the highest score in the NZ Secondary School Rogaine Championship, held in Waitarere Forest on Saturday. WARTS 1 (Callum Hill and William Dorahy) scored 1390 over 4 hours in a forest with a number of the low-lying roads shown in blue. The top girls were Nicola Godwin, Isabella Kelly and Sassafraz Marshall-Johnson from Taranaki. Juniors had 3 hours, and there was an open 6 and 3-hour event at the same time. Preliminary school results (without affiliations sorry), open results, and the course. More detail will appear on the SS Rogaine website. Tim crashed out of the middle distance race, dislocating his shoulder. But Laura was a good 40th, and WOC's Lizzie Ingham 19th. Laura starred again in the relay, bringing the womens team up 4 places to 14th! In spite of Tim's absence, the men also relayed well for 16th, just 10min behind the world's best. And Laura finish her first world championship with 42nd in the long distance (Lizzie 28th). Both women ran all 5 disciplines, the big countries tend to specialise (and rest!) Well done to the whole team! Another world-class run from Tim in the long, finishing 10th, apparently swimming a lake on the way! And again Shamus Morrison was one place ahead, 7 seconds this time! There were three nations with two in the top 10 men: Norway, Sweden and NEW ZEALAND. Kayla Fairbairn and Alice Tilley were also seconds apart, in 48/49th place, with 15yo Danielle Goodall 53rd. Should be an exciting relay today. If you want to show support for our juniors in Norway, what better way than to get out and run round some control points close to home! There are maps and control locations/questions from a collection of P-Max mini rogaines on the Anytime Orienteering page. 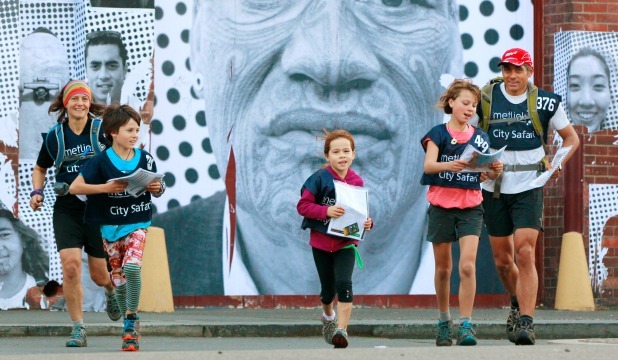 We've just added recent events starting at Percy Reserve and Wgtn's Central Park. High hopes for Tim weren't realised with a wobbly start in the middle JWOC final yesterday. But only a few years ago a place of 22nd would have us breaking out the champers. PLUS Shamus Morrison (WOC) placed 21st as well!!! The two were only 3sec apart. Meanwhile Kayla Fairbairn (NWOC) and Danielle Goodall (CMOC) placed 1st and 3rd in the womens B final. Rest day today, long distance Thursday. Tim qualified easily for the middle distance in JWOC, with 4th in heat (20 go thru). The others were Shamus Morrison (WOC) and Devon Beckman (HBOC). Aside, learning from route analysis is fun and valuable. Though 95% of kiwis shun the local Route Gadget website, there is excellent route choice display and discussion of JWOC and other big events at World of O.
Tim has just won another medal. Gold in the middle distance. Over a minute clear of second and nearly two minutes ahead of third. What an athlete! In the simultaneous world masters championship, former huttie Marquita Gelderman is dominating W40. Another medal for Tim Robertson! Yesterday our amazing huttie placed 2nd in the sprint distance of the MTBO junior world champs. He made 15-20sec of errors and had to re-fold the map to fit his map-board, but only missed gold by 3 seconds! There's a middle today and a long on Friday, follow him here. ...with about 550 people out on the buses, trains, ferry, cablecar and some even used their feet. Top Hutties were Rachel, Liam and "Smidgey" Drew and grandad Paul, 4th in the 3hr event, with Richard and daughter Abby Persson 5th in the 6hr after a disastrous lateness in the prologue. Both are family teams. And another tremendous family effort was that of event manager Kelvin Thiele who developed a computer system to score from text messages with a swish leaderboard at the event; and all his family including parents who helped on the day. Provisional results on Facebook now, they'll be on the website tomorrow. And see the front page of the DomPost!